From the Baldwin County Courthouse, go west on Hancock St. which becomes Highway 49 and follow Highway 49 south for 10.4 miles from the Courthouse. Turn left on Kitchens Rd. and travel 0.9 mile and the cemetery will be located in the woods on the left. 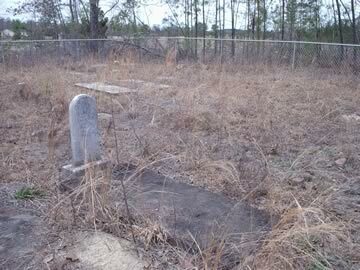 The cemetery is about 100 feet from the road. A dirt farm road leads to the cemetery. w/o J.M. Davis. Since thou canst no longer stay/ to cheer me with thy love/ I hope to meet with thee again/ in yon bright world above.